Tracking your fitness has never been easier; this template can help you get the most out of your workout by tracking your current ability and illustrating what routine works best with your body. No two people are the same so you can’t expect one workout that works for someone will work the same for another. You have to try new and inventive ways to break your current barriers and achieve your fitness goals. The Fitness Schedule is just a free and effective tool to help you accomplish this goal. Learn more about this great template by reading the instructions below. The first step is to download the free template by clicking the link we have provided for you at the bottom of this page. Once you have the document open and ready to go, start your journey in the “Fitness Info” tab of the template. The first thing you will need to do, whether you’re trying to help yourself or your client, is to enter a name and the body type information of the person trying to improve their goals in the indicated areas of this page. Once you have that information down, you can begin filling out the various exercises and the current number of reps and weight you can perform. This information will then be taken and applied to the main page of the workout template. 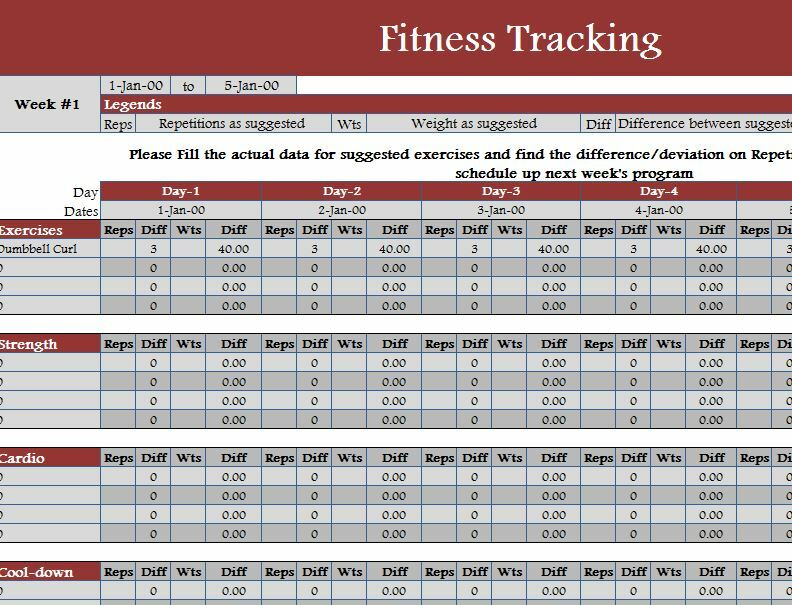 The “Fitness Tracking” tab is where you will see your information come to life and know exactly what exercises you’ll be performing for the week. The Fitness Schedule will even break them down by cardio, strength, or whatever you’d like. The Fitness Schedule is the perfect tool for fitness trainers and enthusiast alike and can help you improve no matter your current level. Download this free template today to get started.